Just south of resort and tourist-packed Cancún, Mexico, lies the small town of Puerto Morelos. Although there are a few small resorts and hotels, it’s still a working fishing village, albeit with a sizable expat population. Anthony Chalas had never even heard of Puerto Morelos until he was online with his brother Nick a few years ago. He was helping plan the annual vacation he took with his family. Someplace affordable. Someplace warm and with a nice beach. “I came with my mom and brother; we were always looking for cool places to go. 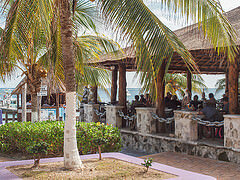 I was on the internet and found Puerto Morelos,” recounts Anthony. “It was only a three-and-a-half-hour flight from New York. We came down, rented a house, and loved it. His restaurant, La Sirena (The Mermaid), sits on the town square, just across the street from a white-sand beach. Set on the second floor, it allows diners to see the vivid blue sea from the eatery’s open-air deck. In towns like the Yucatán Peninsula’s Puerto Morelos, you can open your dream business for a fraction of the cost back home. It’s a place he never could have opened back home. He estimates it would’ve cost $3 million to open a similar establishment in New York or New Jersey. Getting a liquor license alone in New Jersey is $800,000, he says. But with loans totaling $160,000 from his friends and family, he was able to secure a lease on the restaurant space in Puerto Morelos, renovate it to his liking, and get all the furnishings and kitchen equipment he needed. He serves an eclectic mix of cuisine. There are some Mexican favorites, American standbys like chicken wings, a variety of gourmet burgers, salads, seafood, and a range of Mediterranean-influenced dishes—a legacy of his Greek heritage. He sources ingredients as much as possible from local providers for cheese, produce, and seafood but also relies on big purveyors based in Cancún, 30 minutes to the north. When he gets time off, he spends it at the beach—his condo is just a few blocks from the water—or enjoying Mexican traditions with his girlfriend’s family. All in all, Anthony has found the passion of a lifetime. And he’s enjoying life in his new home. You're reading How Mexico’s Caribbean Coast Fulfilled a Business Dream by International Living, originally posted on InternationalLiving.com. If you've enjoyed this post, be sure to follow International Living on Twitter, Facebook, and Google+!